On NPR today, Paul Krugman gave an interview and talked about how the US is experiencing more than just a difficult recession but instead he equated the current US economic situation to the Great Depression. The two paragraphs below from the NPR story are the only words I heard from Krugman today that I agreed with. We are indeed in a period of lousy economic growth and we should not accept these current conditions as the new normal but instead call on our American exceptionalism to strive to do better. The rest of the interview has Krugman channeling the spirit of John Maynard Keynes and saying the government isn’t spending enough. Some pertinent quotes from the NPR interview are below with emphasis mine. Krugman thinks the 2009 American Recovery and Reinvestment Act that ran up our debt by another $787 billion wasn’t enough. Remember that Obama’s economic advisors told him that this stimulus was needed to keep the unemployment rate below 8.0% and we all know how well that worked out. It’s hard to understand how doubling down on failure would have improved our situation but that is what Krugman is saying. Krugman also thinks that it was a mistake to cut back on government payrolls and we should reverse this trend over the past couple of years when local and federal governments have trimmed the fat. It boggles the mind how anyone can say that America is better off when we have more people under government payrolls but we have to consider the source here. Remember Krugman is a proponent of the broken window stimulus fallacy which has been debunked here and here. 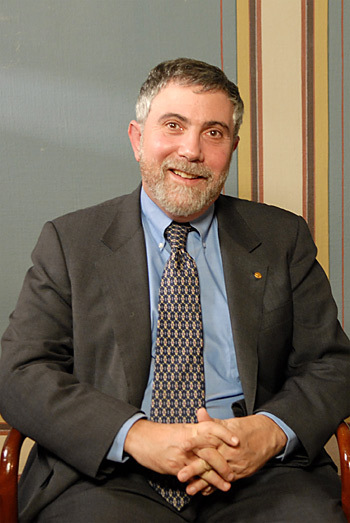 “Though Krugman thinks the solution to our current depression is simple economics, he concedes that politics is never simple. Krugman thinks that Econ 101 teaches us that government spending will spur economic growth and all we need to do is follow this simple advice. He also believes that the recovery of the 1930’s wasn’t due to Keynesian policies because even the massive government intervention in the wake of the New Deal wasn’t true Keynesian since it didn’t go far enough. I won’t get into what got us out of the Great Depression but let’s say for the sake of argument that massive government spending did help rescue us from that economic collapse. The US debt situation in the 1930’s was much different than the situation today and you can see that from the following graph of US Debt as a percentage of GDP (this data was obtained from the US Government Spending website). 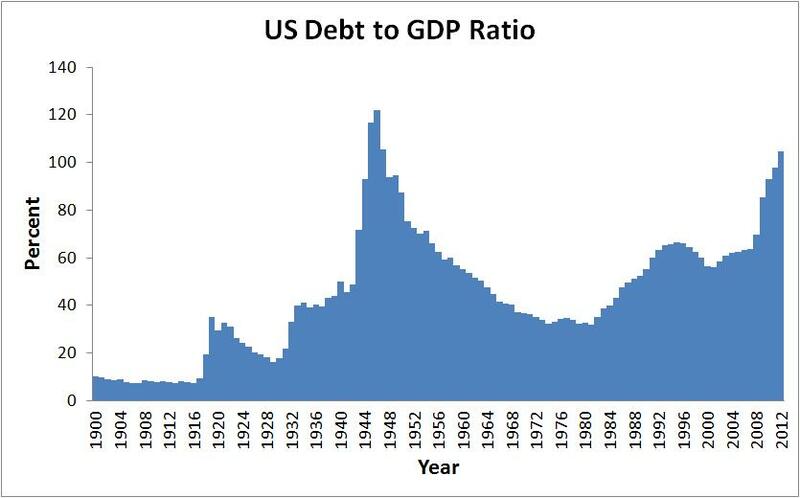 During the Great Depression (1930’s), the US debt to GDP ratio was around 25% so borrowing money and increasing our debt then wouldn’t have had the same disastrous effects as compared to now when the US debt to GDP ratio is over 100%. Is Krugman really saying there are Economics textbooks that say having a debt to GDP ratio greater than 100% is a good thing? If that is true, then why are countries like Greece (who has a debt to GDP ratio of 160%) teetering on the verge of collapse with such high debt to GDP ratios? 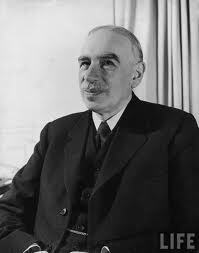 Keynesian economics is a fallacy because it takes money from citizens and gives it to the government to spend in a manner that would not be done in the normal Free Market. The money doesn’t materialize out of the vacuum of space but must be taken from citizens or borrowed from other countries and neither is a valid option at this current time in the US. It’s true Greece has a GDP to debt ratio of 160% but Japan’s was 225% in 2010, second only to Zimbabwe and more than double that of the US. Clearly, debt to GDP is not the only factor in the equation. Spain really is experiencing a true Great Depression by any standard, with unemployment at 25% and youth unemployment topping 50%. However, Spain’s debt to GDP ratio was estimated at 69% in 2011, about the same as the US. So what to make of all these numbers? Unlike Greece and Spain, the US and Japan still make tons of stuff the world buys. And unlike Greece and Spain, Japan can print money. The US is not only printing unprecedented amounts of money with quantitative easing but also enjoys (for now) unique status as the world’s reserve currency. What is different about the US situation now vs. the Great Depression is that after World War II, the US was the only country in the world with it’s manufacturing capacity not only untouched but enhanced by the war. Europe, Japan and Russia were destroyed. China was not a factor with Mao’s special brand of totalitarian communism. As a consequence, the US stood alone with virtually no competition for nearly 30 years. None of these conditions still exist. What is different about Japan and the US is that only 5% of Japan’s debt is held by foreign countries. Over one third of US debt is held by foreign countries with China as the largest US creditor. What Krugman either does not understand or is not stating is that the US is very vulnerable to a “Black Swan” event. The path we are currently on is unsustainable as there is literraly not enough money in the world to lend to the US at our current borrowing rates. Printing money the world will accept is fine until the day it stops. When that day will come is anybody’s guess but taxing producers and borrowing money that can never be repaid, to deliver entitlements to the idle masses, is not a formula for future growth. You would think someone with a Nobel Prize in economics would understand this. But then again, these are the same crazy Swedes who gave Peace prizes to Jimmy Carter, Yasser Arafat and Barack Obama. Sometimes you just have to consider the source. Outstanding insights Blaine. It is so true that in this global economy the US is not the only game in town. There will be a time when other countries will stop buying dollars and who knows when that will happen but if we continue on this path your ‘black swan’ even will eventually happen. Then all Hell will break loose. Thanks for showing actual data! So much policy discussion these days is yammering heads. But a couple of things leap out from this chart. First, there’s a delay between action and its reflection int eh debt. For example, see the end of WWII versus the debt peak. Second, we have Reagan and Bush I causing a strong positive slope in %debt, and we see that W precipitated a similar positive slope. Third, that slope continue under Obama. Now, of those presidents only one presided over an existential crisis: Obama. I was following news carefully in 2008-2010. Many economists of every stripe thought that we faced a serious risk of economic collapse. W started the economic stimulus strategy and Obama continued it to the same tune. Now that the stimulus has ended, that curve has plateaued. I’m a fiscal conservative, and have favored balanced budgets since, well, I first became aware of deficit spending int he 70s. But it seems to me that the modern GOP only talks about fiscal discipline when they are out of the executive. As soon as they get in, they start spending like crazy. Look at Reagan, Bush I and W. Furthermore, it seems to me that our military is MUCH larger that in needs to be, given the size of other militaries in the world. And, since I’m Libertarian, I just don’t see a need for major wars. If we must get entangled, the way Bush I handled the Gulf ar is the way to go: slap down the despot and keep him down through air control. In fact, Bush I’s memoir explained exactly what would go wrong in Iraq. So why the disconnect between the GOP’s rhetoric and their actions? I just can’t see may way clear to voting for these guys, and I’ll go instead for Libertarian, yet again. The GOP is just as bad as the Dems of the 60s, except for the talk when they don’t have power. It’s all hot air from both parties, and we should harness that as alternative energy! That debt to GDP chart is an excellent argument that we are not in a crisis now and that we can spend even more and still recover and eventually reduce the US public debt. We reduced it before with a much higher income tax rate then we have now, that was at times as high as 95% (of course after deductions almost no one paid more than about 50% in the upper brackets) The economy boomed and we built the national highways system during that time, for instance. There are other factors involved and with globalization it will be somewhat harder to bring the debt down, but your argument actually proves Keynesian economics works.